On October 15th, the Portland Japanese Garden hosted a Noh lecture and mask carving demonstration to celebrate the opening of the exhibition of Mirrors of the Mind: The Noh Masks of Ohtsuki Kokun which runs until December 3rd. This event was also part of the year-long celebration of the opening of the Garden's Cultural Village in April. 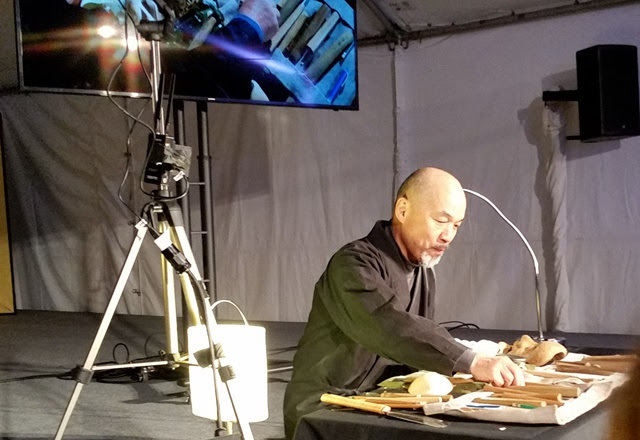 For this event, Yoshiaki Shimizu, Professor Emeritus from Princeton University and current Portland resident, presented a lecture on Noh followed by a Noh mask carving demonstration by Ohtsuki Kokun. 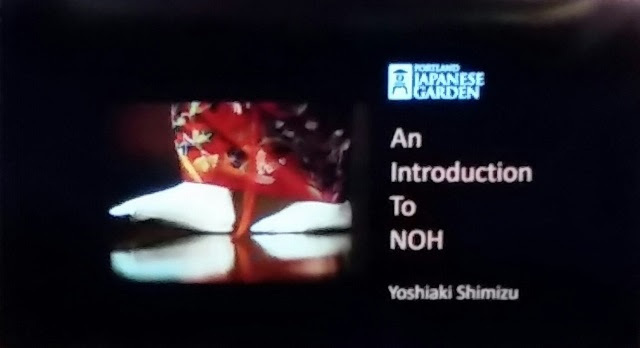 Noh is meant to be taken in as a whole, rather than the separate elements. The square Noh stage represents the Divine Presence. The pine tree motif appearing at the back of the stage represents the god within, referring to the pine tree where god descended in Nara. Chanters sit to the right of the stage while the musicians sit along the back. To the left of the stage is a goshiki (five color) curtain in green, yellow, red, white, and black. Goshiki curtains can also been seen displayed in sweets shops, in kabuki theaters, and in Buddhist temples. The room behind the goshiki is the kagami no ma (mirror room) where actors will don their masks, becoming the character. The shite (main actor) is usually a person from the past or a spirit. The waki is a companion actor or subordinate. Professor Shimizu shared an excerpt from Funa Benkei. In it we could see examples of the "slowest profudity" in the entrance of Yoshitsune's mistress, Shizuka, her gestures of weeping, and the rubbing of beads by Benkei to exorcise the vengeful ghost of Tomomori. 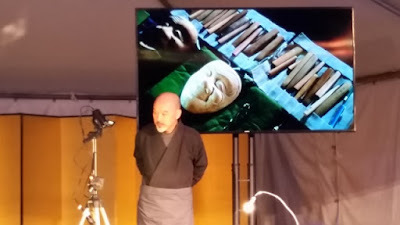 Master-carver Ohtsuki Kokun took the stage to work on a new Okina mask with narration provided by Professor Shimizu. 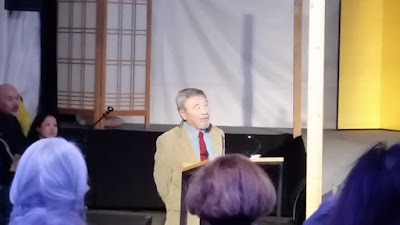 During this time, the audience was invited to ask questions. Ohtsuki Kokun has been carving Noh-men (Noh masks) since childhood, studying under Soshun Nagasawa. He makes masks for a number of high-profile actors, including members of the Kanze family, and holds mask carving workshops. The Noh mask is a visual representation of happiness and sadness on stage. 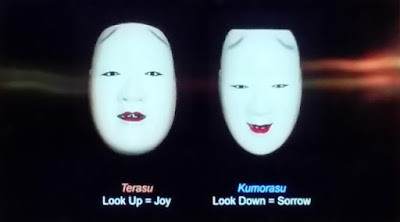 A mask tilted up depicts happiness (terasu) while a mask tilted down depicts sorrow (kumorasu). A woman's age is depicted by the number of hairs on the mask and a man's age is depicted by the color and shape of mask. Only a spirit or main character will wear a mask in a Noh play. There were over sixty types of Noh masks by the 17th century with Okina being among the oldest. Ohtsuki's first mask was ko-omote (young woman) which is traditionally the mask younger carvers start with because it gives them a measure of progress as carvers. Ohtsuki's tools are hard iron with soft iron edges, making them easier to sharpen. The Japanese saw he used to create the hinged jaws of the Okina mask is pulled rather than pushed like saws in the west. Cypress wood harvested from Kisou is preferred for Noh masks as it has tighter lines due to slow tree growth. Though craftsmen have chosen this wood for hundreds of years, current actors often don't know why they use this wood. The wood will achieve an ideal 20% humidity after approximately five years. A two hundred year old mask will become very lightweight like papier-mâché due to dehydration. Masks up to four hundred years old are still in use today. The mask is coated with four coats of lacquer on the front, traditionally made from pulverized, burned oyster shell and a paste made from boiled fish bone collagen (organic glue). The mask is smoothed using a plant with a scouring surface or shark skin, and varnished. Then, features are added with black ink made from soot from bamboo slats, collected from homes and boiled, and with red cinnabar. Of the sixty classic Noh masks, each acting family has its own style. 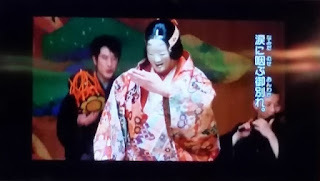 In modern Noh plays, actors have the freedom to ask for new or different masks, allowing for creativity in commissions. Even during the brief interludes between commissions, Ohtsuki continues to carve.